Mt. Guiting-Guiting Natural Park under the DENR – BMB which was declared through a Presidential Proclamation (PP) No. 746 in 1996, with a reserve area of 15,260.48 has. 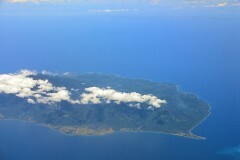 Ancestral Domains (Small and Big CADT) of the Sibuyan Mangyan Tagabukid under NCIP covering 8,408 has of the island. The island is dubbed as the “Galapagos of Asia” as it is home to a wealth of endemic flora and fauna. The highest peak in the island is Mt. Guiting-Guiting, with an elevation of 2,058 meters above sea level, and a recognized key biodiversity area. The island is also known for the Catingas River as one of the cleanest river in the world. Most forested areas are lowland forests, but the habitat types range from mangrove forest, to caves, to peat swamp forests, beach forests, freshwater, and marine. Despite its protected status, Mt. Guiting Guiting and other natural areas on the island remain under serious threat. Sibuyan is home to 700 vascular plant species, and 144 recorded species of trees, ten of which are in the IUCN (International Union for the Conservation of Nature) Red List. Thirty-three are Philippine endemic tree species, while two are island endemic (Elaeocarpus argenteus var. gitingensis and Astronia gitingensis). Fifty-four plant species are endemic to the island. There are at least 83 recorded Philippine endemics in Sibuyan, with four of them island endemics. Eighteen of them are in the IUCN Red List of Threatened species. A total of 130 bird species were recorded in Sibuyan, including the Rufuous-lored Kingfisher (Halcyon winchelli nesydrionetes), and the Philippine Hawk-Eagle (Spizaetus philippensis). Sibuyan is home to 9 native terrestrial mammal species (four of which are endemic rodents), 9 bat species (including the endemic Sibuyan Pygmy Fruit Bat (Haplonycteris sp. A), 16 Philippine endemic reptiles, among others. The indigenous dwellers of Sibuyan are the Sibuyan Mangyan Tagabukid (SMT). Two Certificate of Ancestral Domain Titles (CADTs) were issued to SMT covering 8408 has across Cajidiocan and San Fernando. The Romblon Electric Company, which supplies power to the province, has been operating in Sibuyan without a Free and Prior Informed Consent (FPIC) from the tribe for the utilization of the Cantingas River. [Sibuyan Island Biodiversity and Socioeconomic Assessment Report. Fauna & Flora International. Sibuyan Island Rapid Biodiversity Baseline Assessment. Fauna & Flora International and the Foundation for the Philippine Environment. 2013. Sibuyan Mangyan Tagabukid Factsheet. Mainstreaming Indigenous Peoples Participation in Environmental Governance, Fundacion Desarrollo Sostenido and the Foundation for the Philippine Environment. Indigenous socio-cultural practices are diminishing, practices being replaced by non-indigenous technologies that promise short term gains but tend to be unsustainable. Communities near the forest have little to no alternative source of income. They make their living through swidden farming (kaingin), charcoal making, gathering of minor forest products (resin, rattan, vines, honey, freshwater fish / shrimps). Increasing population has been associated to decline in forest cover. Forest resources have diminished, with communities exploring more distant forested areas, establishing more forest trails, leading to more disturbance. Population growth has also affected the forest through land use changes, for agricultural activities. Unregulated / illegal logging, mining, hunting and poaching, clearing for agriculture, fire, direct and indirect pollution. Unsustainable / unregulated harvesting of honey and other non-timber forest products, and charcoal production (used mostly as fuel for cooking) persist. Mining applications from large scale mining firms encroach on Mount Guiting-Guiting Natural Park (MGGNP) and watershed areas. About 43% of Sibuyan has been placed under different mining claims—overlapping in the protected areas, and in the SMT ancestral domain.